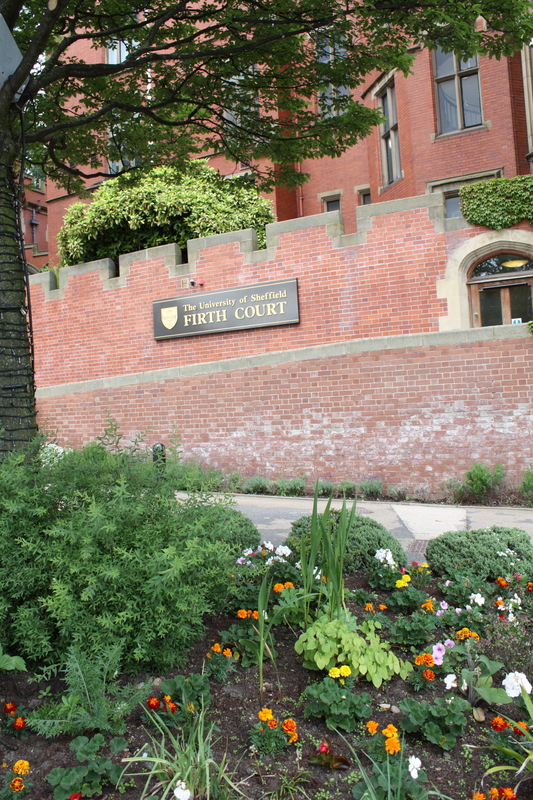 The University of Sheffield has had its security management recognised after gaining the prestigious Secured Environments accreditation. 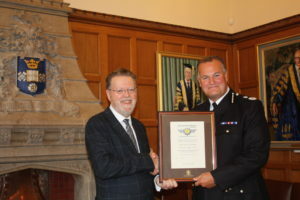 The award, which recognises that the University is following six key principles to maximise the safety of staff, students and visitors, was presented to President and Vice Chancellor of the University, Professor Sir Keith Burnett by the Chief Constable for South Yorkshire Police Stephen Watson. 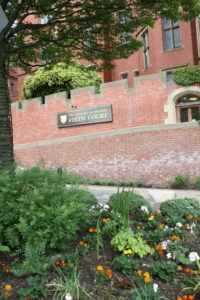 The University faces a number of challenges in managing security, not least in terms of its size and scale, but also their central location in the city centre, and the varying functions of their numerous sites and buildings. The award includes not just the city centre campus, but also university-owned accommodation and the Advanced Manufacturing Research Centre (AMRC) buildings. 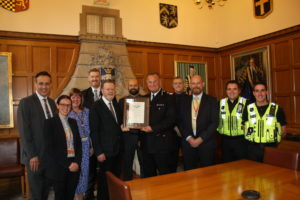 Chief Constable Stephen Watson said: “I am delighted that the University of Sheffield, which is a first class university, has put the effort into attracting this accreditation. What we know is that Secured Environments, which is related to Secured by Design, works on the basis of evidence and it’s very fitting therefore that a university should apply the evidence to putting the hard work in to attracting this particular piece of accreditation. 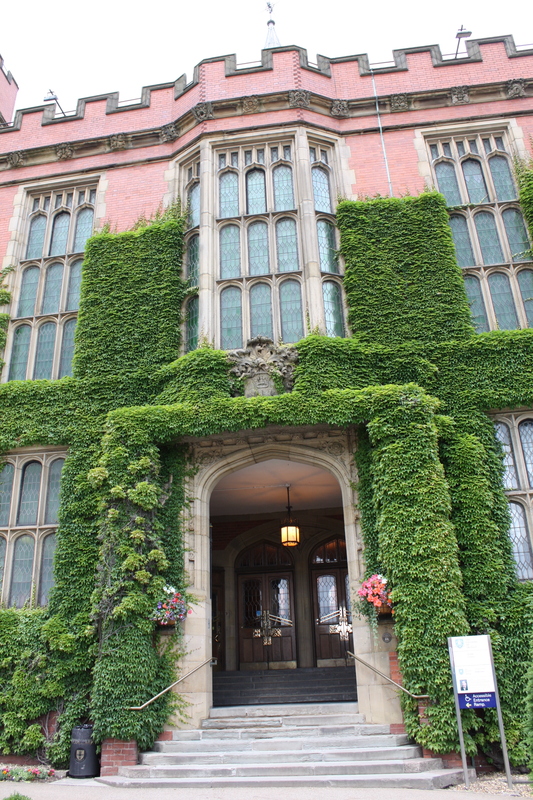 Richard Yates, Head of Security at the University of Sheffield, reflected: “We are thrilled to have been awarded the Secured Environments accreditation. There are other accreditation schemes available, but none have got the same academic merit and background. “This accreditation allows us to demonstrate to students, staff and visitors at our University that we are committed to security and safety, and that this has been independently audited against a high set of standards outlined by Police Crime Prevention Initiatives. 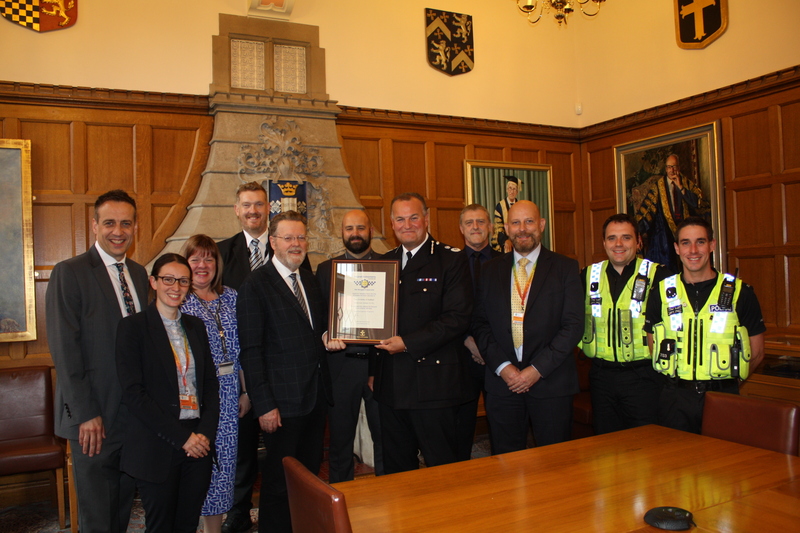 “Achieving this award has been a University-wide effort, from the Vice-Chancellor, senior management and the security team, as well as the unprecedented number of colleagues who supported us by completing a survey. Secured Environments is a police certification scheme. It was established in 2007 and presents certification to organisations that are able to show that they have adopted six key principles for protecting themselves against crime. Secured Environments provides a framework for managing and meeting the challenges faced, and it enables organisations to refine their approach and demonstrate that it is effective. The aim is to help organisations to think about their risks and how to make the best use of measures they already have. The six key principles are commitment to create a secure environment, understand the risks, respond to reduce the risks, management plan to achieve aims and objectives, implement the solution and evaluate the process. Secured Environments was developed through the partnership of Police Crime Prevention Initiatives and Perpetuity Research and Consultancy International Limited (PRCI), a specialist in crime, risk and security management. Secured Environments locations include a landmark building, shopping centres, universities, halls of residence, a hospital, data centre and business premises. Secured by Design (SBD) seeks to achieve sustainable reductions in crime through design and other approaches to enable people to live in a safer society. SBD trained officers and staff in Police Forces advise on proven crime prevention techniques in a range of sectors including housing, commercial, transport, health, education, leisure and many others. SBD work with many other organisations, including National Government, British and European Standards authorities, trade associations and the construction industry and encourage manufacturers to achieve our accreditation – a high standard which ensures quality over time rather than one off testing. We have more than 650 member companies signed up to SBD. Independent research by The University of Huddersfield shows that SBD developments that include crime prevention techniques in the built up environment and accredited products like doors and windows can reduce crime like burglary by up to 75% in new-build homes. Evidence suggests this level of crime reduction is sustainable year-on-year and represents a significant reduction especially as most SBD developments are in social housing in deprived areas. Falling crime brings less demand on the Police and Local Authority resources and use of police accredited products means less maintenance – freeing up budgets for other priorities. During our 29 years’ working with local communities, we have adapted to changing patterns of criminal behaviour. Our knowledge and practical guidance is captured in our building guides. SBD services are self-funded. Police Crime Prevention Initiatives, which is administered by the Mayor’s Office for London, owns and operates the trading entity Secured by Design on behalf of the Police Services of the United Kingdom. The organisation’s board members include two Chief Constables, including the National Police Chiefs’ Council’s Crime Prevention Lead, two Assistant Chief Constables, an assistant Commissioner with the Metropolitan Police, and former Assistant Chief Constable for Sussex.